Good nutrition is an important part of leading a healthy lifestyle. 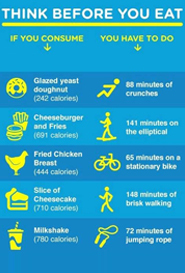 Combined with regular exercise, proper nutrition can help you reach and maintain a healthy weight. Without proper nutrition to compliment your regular exercise regimen, you could be wasting your efforts. You cannot have one without the other. Or put simply, if you do not eat healthy and thus eat more calories then you burn in a day, you actually gain weight instead of losing it. Regular exercise combined with poor eating habits, equates to slow or non-existing progress, or worse, it puts your entire body at risk. That can include, hormonal imbalances, adrenal fatigue, and injury. We all know that regular exercise is good for us, but do you know how good? For those who want to feel better, have more energy, and improve almost any and every area of their life, just exercise. With this in mind, do not forget that the benefits of regular exercise can only be achieved when combined with a proper nutrition regimen. Realizing your own body’s potential through an ideal balance of regular exercise and proper nutrition, will ensure the effort you are putting in is worth it. If you want to live a fit lifestyle every day, eat for nourishment, and exercise regularly. Part of making healthy eating your lifestyle is setting aside the time to do it right. This means sitting down to a meal whenever possible, preferably at a table, with the people you care about. Two of the central ideas behind losing weight and keeping it off are balance and moderation. Don’t avoid or deprive yourself of nourishment and do not over eat. By balancing your portion sizes to fit your particular nutritional needs and weight loss goals, your efforts will come to fruition. With a balance of nutritious foods that fuel your body and mind, your regular exercise routine will propel you to be the best you have ever been. Keep in mind, by setting realistic goals you will not create undue pressure for yourself. As they say, Rome was not built in a day. With hard work and determination, anything and everything is possible. All you have to do is believe you can! Be real with yourself. Know your body’s limitations. Know when to say no and when to let loose! Think before you eat, and let food be your medicine. 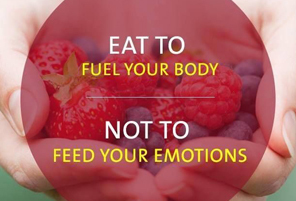 Remember, every time you eat is an opportunity to nourish your body. If food is fuel, you have to make sure you are putting in the right fuel. You see, living a healthy life, and maintaining a healthy weight, is all a series or choices. Choose well, and your body will respond! 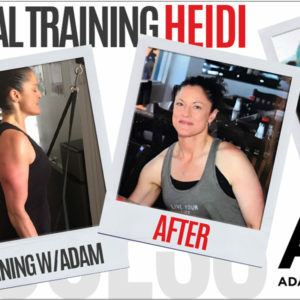 Discover how working out and eating right has helped one of our clients lose weight and keep it off.